The Waller TS 5.4 was inspired by the famous Hartley TS I6. The design parameters were to produce a design in the same mould, easy to build, light, fast and fun to sail. It also had to be more modern and upmarket utilizing the latest design and construction techniques. The TS 5.4 is designed for two people, and is ideal for a couple, or parent and older child. For day sailing a large crew can he comfortably carried in the massive cockpit. The small cabin contains minimal overnight accomodation for two. Construction is timbcr/plywood/epoxy/glass, and the hull can be built from molded plywood/veneer, or strip planked in cedar. Deck, cockpit, cabin and all bulkheads are simply constructed in plywood. The rig has been kept as simple as possible without compromising the boats performance potential. Fittings and systems have been kept to a minimum utilizing hasic off the shelf items. All spars utilize off the shelf stock parallel sections. The boat is easy. to construct and rig, and can be entirely home built with the exception of the easy to reef fully hattened mainsail, roller furling jib and spinnaker. For simplicity and ease in handling a smaller asymetric kite set on a fixed one metre bowsprit is an option. With only I2Okg of ballast, the WALLER TS 5.4 is effectively an overgrown dinghy, relying on hull shape and crew weight for much of it's stability. All in all, the boat provides an exciting ride at minimal cost for those who enjoy a sprightly sail. Depending of method of construction, plywood species, fittings, sails and other variables the WALLER TS 5.4 on a new trailer with small outboard should cost less than $14,000 to build. A good boat is more than the sum of its parts and the Waller TS 5.4 is a great boat. A development of the WALLER TS 5.4 is a new multichine plywood version which is currently being drawn with the aim of providing a computer designed and laser cut kit boat. Believing that there is a market for a multichine kit boat of similar design James Frecheville redrew the body lines of the TS 5.4 and designer Mike Waller has all but completed the neccessary profile, half breadths and waterlines for this new boat now called the WALLER 540. 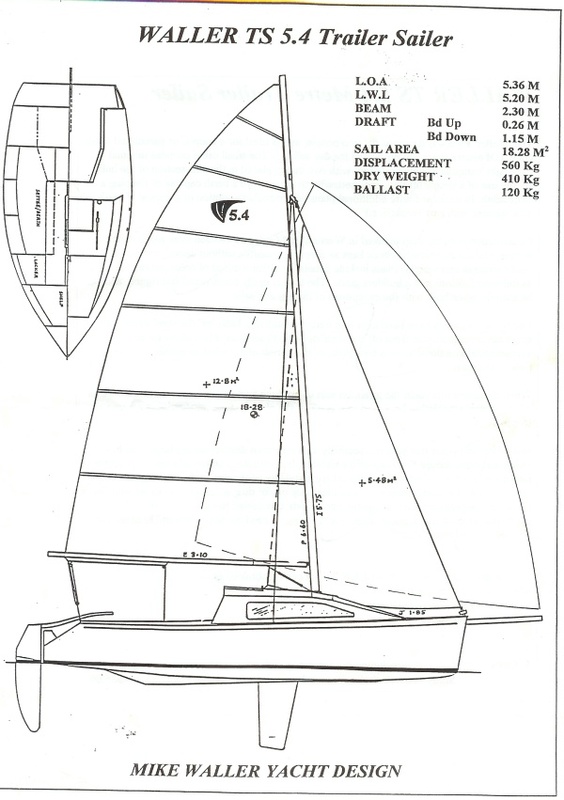 The design brief was to produce a boat so similar to the TS5.4 that they would be comparable in performance and handling. It was also a design parameter that the hutl could be manufactured in kit form for amateur construction where a building jig and chipboard mould stations were not required. The WALLER 540 will be built around it's bulkheads sitting on the workshop floor. No strongback will be required and all conponents used in construction will be part of the completed boat. Further information on this exciting new development is available from both designer Mike Waller and licenced builder and agent, FrecheviIle Heaney boatbuilders.